Fans of classic Twentieth Century Fox fright films can relive The Fly, House on Haunted Hill, 28 Days Later, and Carrie as immersive theatre experiences when Horror Rewind comes to Los Angeles later this month for 3 days only. Horror Rewind is a brand-new Halloween experience coming to downtown Los Angeles on October 13-15. The free event, which is presented by Twentieth Century Fox Home Entertainment, puts visitors inside a frightening, immersive theater experience inspired by four fan-favorite films: Carrie, The Fly, 28 Days Later, and The Hills Have Eyes. This immersive experience is produced by The Great Company, a Los Angeles-based creative studio, in collaboration with Delusion, the interactive horror theatre company created in 2011 by writer/director Jon Braver. The concept behind Horror Rewind is that a deranged horror movie super fan has created an installation in a secluded corner of the Arts District of Los Angeles, paying tribute to his four favorite horror films by trapping innocent civilians inside and transforming them into demented monsters. 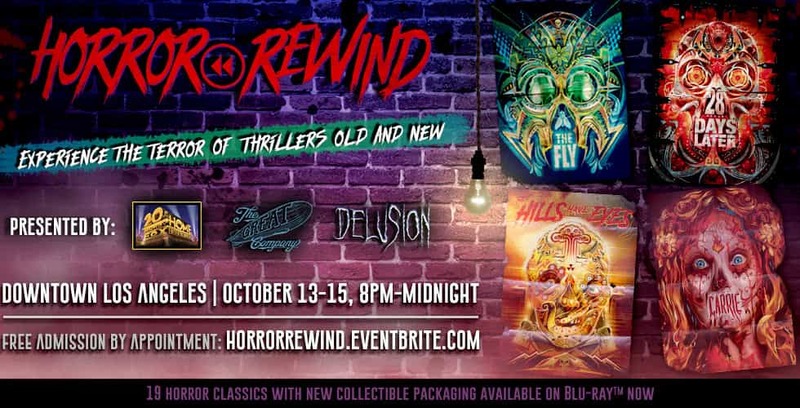 After experiencing Horror Rewind, guests will be be able to visit a van outside and purchase any of 19 new Blu-rays featuring collectible packaging cover designs by digital artist Orlando Arocena. Limited edition posters of Arocena’s work will also be available as a gift with purchase while supplies last. Fans can also purchase the full line-up of the Halloween faceplates from Arocena here. Horror Rewind will take place on Friday, October 13, through Sunday, October 15, from 8 p.m. to midnight. Admission to Horror Rewind is free but tickets are extremely limited and available on a first come/first served basis. Register in advance at HORRORREWIND.EVENTBRITE.COM to receive an appointment day and time. A limited number of standby tickets will also be available via the above website. The exact event location in Los Angeles will be revealed upon ticket confirmation.